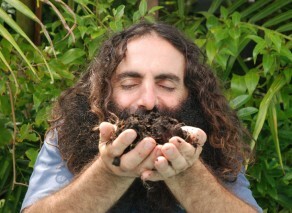 Costa Georgiadis, landscape architect and host of ABC’s Gardening Australia is the ambassador of Composting Week. WEEDS – it’s not a dirty word. We treat them as an unwelcome visitor that needs to be ripped out and thrown away. But weeds can provide an opportunity for clever gardeners. By composting weeds and then reapplying to your garden, you are repairing and improving your own garden. As part of International Composting Week (May 6 – 11) a workshop will be held in Thirroul tomorrow (Thursday) to help the community grow their own ‘A Grade dirt’ for their gardens. Council Promotions Coordinator Fiona Netting said compost that you make yourself is tailor made to your garden. “By making home-grown compost, you don’t need to buy different fertilisers for your azaleas, another for your oranges, and another for your veggies,” she said. “Plants that feed on your own compost are more resistant to insect attack as they are healthier. Grass clippings in your compost helps raise bacteria levels. Most cut grass contains high levels of bacteria which is beneficial to your compost. “Rake up your autumn leaves and add them to your compost. Crunchy autumn leaves are high in sugars which your compost creatures will love. If leaves are left to break down on their own, it can take up to two years. If added to your compost, it takes only three months to break down. Bookings for Thursday’s composting workshop can be made by contacting Council’s Green Team on 4227 7262 or email GT@wollongong.nsw.gov.au. Gardeners are also encouraged to take part in the International Composting Week Photographic Competition. Send in a photo of your flourishing garden with your enormous vegetable, bountiful produce, or beautiful flowers at their best. The best photo as selected by Council’s judges will win a $200 voucher from the Wollongong Botanic Garden and a Vertical Garden (valued at $250). Entries need to be received by Monday May 13. Include your full name; contact phone number; email address and suburb and email to GT@wollongong.nsw.gov.au or send to Wollongong City Council, Environment Strategy and Planning Division, 41 Burelli St, Wollongong NSW 2500. Visit Council’s website for full terms and conditions. For more information on International Compost Week visit International Composting Week.